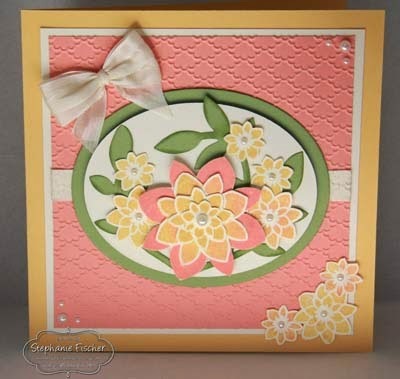 I made this card for the Splitcoaststampers May Catalog Focus Challenge CCREW0515CF. The challenge is to use any catalogue products that we've harbouring but haven't used yet. Crazy About You was one of those stamp sets that I just had to have - but mainly for the sentiments - and then (the horror of it) didn't use! I think I didn't fully appreciate the the flower images and failed to see the possibilities. Well, better late than never! I stamped the flowers in So Saffron with a touch of Crisp Cantaloupe and cut a variety of sizes and layers. The centre flower has four individually cut layers. I teamed the retiring Crisp Cantaloupe colour with So Saffron and Pear Pizzazz highlighted with Very Vanilla cardstock and seam binding. I've also used the leaf spray from the Flower Frenzy Bigz die (the edges sponged with Pear Pizzazz) and the Fancy Fans embossing folder - both retiring. The centrepiece was cut with the Ovals Framelets and the Very Vanilla oval was popped up with dimensionals. Pearl Basic Jewels finish it all off. Why not have some fun and play along. Visit the gallery for some great inspiration. We'd love to see your creations - share them with us by uploading your image to the Creative Crew gallery Remember to include the code CCREW0515CF in your Key Words. 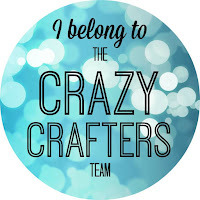 Labels: Crazy about you, Fancy Fans embossing folder, Flower Frenzy Bigz, Retiring Products 2015, Stampin' Up!